I had to obtain my 10-year-old son’s permission to write this post, as it contains his own recipe creation. He had guarded it for the last two years, but is finally ready to share with the rest of us. It was created in Milanówek – a beautiful garden town near Warsaw, during a visit to my husband’s godmother’s summer house. Ever since then, whenever we boarded the train to go there, he’d maniacally demand the products for his dish. So even before we would get to the tranquil rose garden, I would almost smell the pungent curry in my head. Many times I was on the verge of telling him that chickens had gone extinct to free us from the curry tyranny. However, as it was me who created the gourmet monster by introducing him to oriental spices, seafood, coconut milk, Thai noodles, sushi – the list of my crimes could go on and on – I sat put and ate my curry. 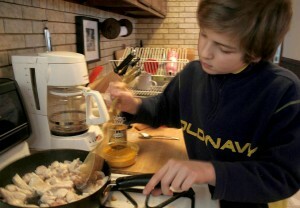 It is really a great, filling and easy recipe – I just don’t like that much repetition, and kids that age excel in it. Regardless, I would let him indulge us once in a while on weekends, when I was too lazy to cook – besides, you’ve got to encourage children in the kitchen. Last Saturday was one of those days, and Eryk was happy to oblige. Originally he would use sour cream for the sauce, but since I now have a steady coconut milk supply from the Tai Nam Food Market on 4925 Broadway – Chicago’s Vietnamese neighborhood – adds that instead. 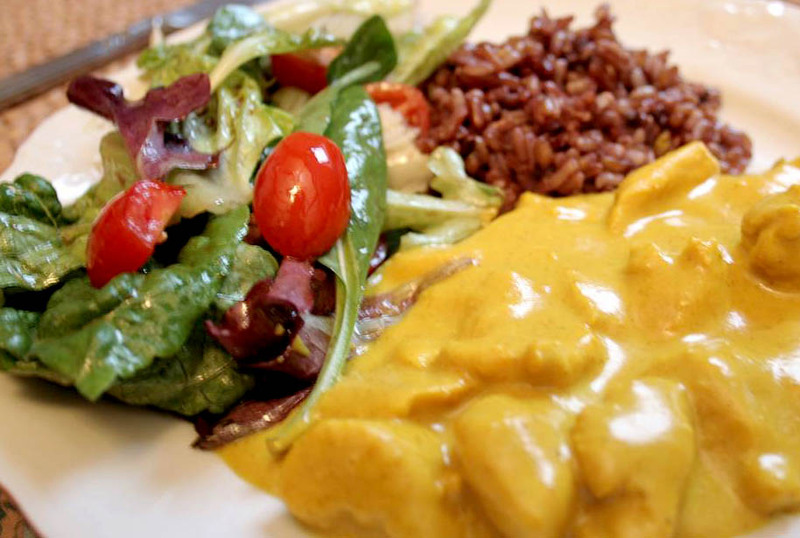 Some of the first spices I bought when we moved here were bright yellow turmeric and medium spicy Thai curry powder, both with Eryk’s dish in mind. Another modification I introduced was marinating the chicken breasts in buttermilk, which prevents the meat from drying. We eat that with rice and a simple green salad or with garlic naan bread, whenever I can get some. Originally baked in a hellish hot Tandoori oven, it’s hard to make at home. 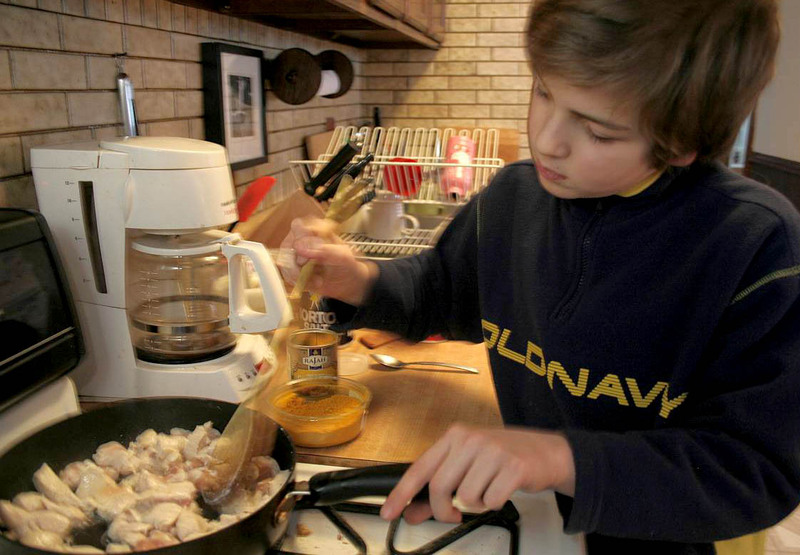 Take the kid, give him a knife and watch him carefully cutting the chicken breasts into bite-size cubes. Place the meat in to a bowl, add the salt and buttermilk, turn to coat well and leave for 30 minutes. Now you can start making the rice. I’m not very keen on this ingredient, but recently I found an amazing mix of wild, black and red rice in my Vietnamese market and the smell of it when it started cooking made me gasp – sweet and nutty. Wash the rice once. Melt the butter in a heavy-bottomed pot, add the rice, stir for 1 minute and add the water and about 1 tbsp salt. Bring to a boil and then turn the heat down to a simmer, cover and let cook for 20-30 minutes or until all the water is absorbed. Remember that wild or black rice will need more time than the usual white stuff. Don’t take the lid off during the first 20 minutes. Heat the oil in a frying pan or wok over medium heat, add the chicken with the buttermilk it was marinated in – it’s better not to use the kid during this step. Give the kid a wooden spoon and let him/her stir the meat until it’s seared from all sides. Add the spices and stir for 2-3 minutes, then pour in the coconut milk (or sour cream). Lower the heat to medium low and keep the kid stirring. If the sauce looks too thick, add some milk – ¼ cup at a time until it looks righ. Add more salt or curry if needed. If I let Eryk do it his way, he would use 4 tbsp of the curry, but then I would have to make something else for his sister, which is not the effect I’m looking for on a lazy weekend afternoon. But you can make it as hot as you like. Let it cook for 3-4 minutes more. If your timing is good the rice should be ready by now and you can serve everything hot with a quick mixed-greens salad tossed with lime (or lemon) juice and olive oil. It helps to clean your palate and adds extra color and vitamins to the dish – if you manage to make the kids eat it. This entry was posted on Tuesday, January 20th, 2009 at 10:05 pm	and is filed under Kids, Mains. You can follow any responses to this entry through the RSS 2.0 feed. You can leave a response, or trackback from your own site.